Howard Street, Between Third & Fifth Sts. 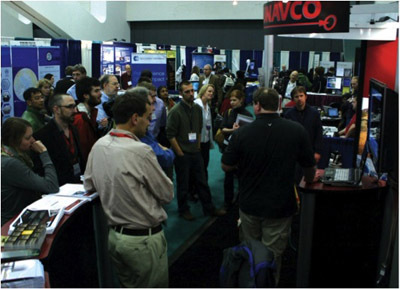 The AGU Fall Meeting is expected to draw a crowd of over 18,000 geophysicists from around the world. The Fall Meeting provides an opportunity for researchers, teachers, students, and consultants to present and review the latest issues affecting Earth, planets, and their environments in space. This meeting will cover topics in all areas of Earth and space sciences. Find UNAVCO in the exhibit hall, Moscone West, at Booth 250 on NSF lane. We will have topic sessions at the booth all week presented by UNAVCO staff and community members to share knowledge about the latest tools, resources, and research. View the current Booth Sessions schedule below (and download a pdf of the booth sessions to your mobile device) Staff and community members will also be available to answer your questions, (current staffing schedule (pdf)). Please join the UNAVCO staff at the AGU Geodesy Reception on Tuesday, December 14 at 6:30pm InterContinental Hotel San Francisco, InterContinental Ballrooms B-C, 888 Howard Street . Following the AGU Geodesy Reception, all UNAVCO community members are cordially invited to attend the UNAVCO Annual Meeting, which will commence at 7:30pm in the InterContinental Hotel, InterContinental Ballroom A. We have compiled UNAVCO and RESESS co-authored talks and poster sessions into a handy itinerary (pdf) so you can add them to your personal itinerary. If you're on Twitter, use hashtag #AGU10UNAVCO to tag your tweets and keep up with events and information related to the UNAVCO community throughout the meeting. Figure 2 - Multiple groups will be demonstrating the applications of LiDAR for scientific research. See the UNAVCO booth schedule for details. 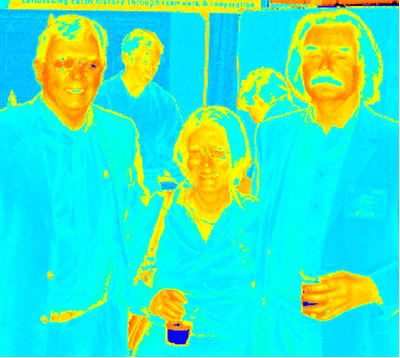 Shown in this LiDAR scan from left to right, are Jim Whitcomb, NSF, Meghan Miller, UNAVCO President, and John Oldow, UT Dallas.